Vauxhall recommend replacement every 72,000 miles or 5 years. Crankshaft timing pin – Kent Moore No.6031. Engine support – Kent Moore No.6210-A. M6 bolt – for adjusting tensioner. Tension gauge – Kent Moore No.6225. Tensioning tool – Kent Moore No.6234. NOTE: If timing belt has failed, it is possible that the camshaft sprocket key has been damaged which would cause incorrect valve timing. NOTE: Battery fitted under LH seat. Auxiliary drive belt. DO NOT reuse belt. 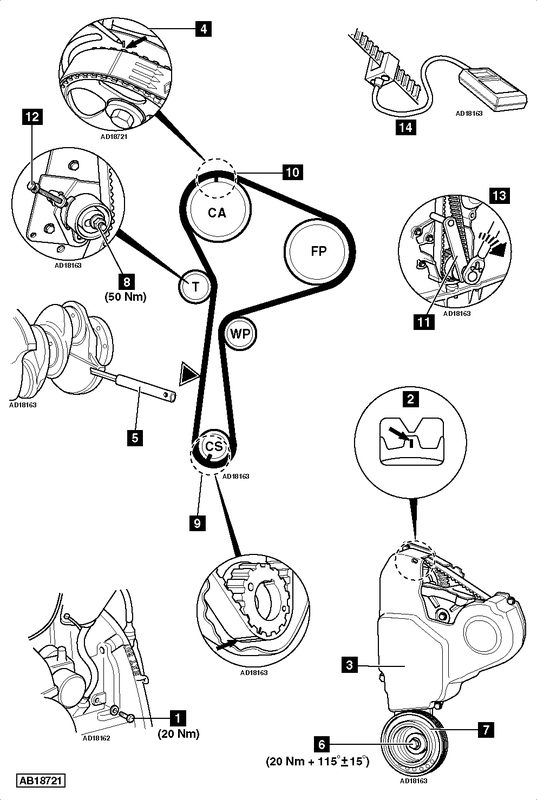 Auxiliary drive belt tensioner (if necessary). Install engine support to subframe. Tool No.6210-A. Blanking plug from cylinder block  . Detach wiring harness and fuel pipe from RH engine mounting. Move to one side. Turn crankshaft clockwise until camshaft sprocket timing mark aligned  . Remove timing belt cover  . Mark sprocket and engine with paint or chalk where indicated  . Insert crankshaft timing pin  . Tool No.6031. Turn crankshaft slowly clockwise until timing pin engages. Slacken tensioner nut  . Move tensioner away from belt. NOTE: DO NOT refit used belt. Timing belt must always be renewed once it has been slackened or removed. Fit timing belt in anti-clockwise direction. Ensure marks on belt aligned with marks on sprockets  &  . Ensure belt is taut on non-tensioned side.NOTE: Observe direction of rotation marks on belt. Fit tensioning tool  . Tool No.6234. Remove crankshaft timing pin  . Screw an M6 bolt into tensioner bracket until tensioner pulley contacts belt  . Apply clockwise torque of 11 Nm  . Attach tension gauge to belt at  . Tool No.6225. Screw in M6 bolt until tension gauge indicates 95±3 Hz. Temporarily tighten tensioner nut  . Tightening torque: 10 Nm. Insert timing pin in crankshaft  . Rock crankshaft slightly to ensure timing pin located correctly. Tension gauge should indicate 90±3 Hz. If not: Repeat tensioning procedure. Tighten tensioner nut  . Tightening torque: 50 Nm. Refit blanking plug  . Tightening torque: 20 Nm. Lock flywheel with large screwdriver. Fit new crankshaft pulley bolt  . Tightening torque: 20 Nm + 115°±15°.